Contemporary style and durable construction withstand heavy warehouse use, these cabinets fill a variety of needs at an excellent price. Made of durable cold rolled steel using 24 gauge steel body reinforced with a 22 gauge steel frame. Reinforced doors include 3-point locking mechanism with a super strong 5/16" round locking bar and nylon guides for silent operation and consistent alignment. Recessed locking handle with 2 keys for safety and security. 22 gauge steel shelves are height adjustable at 2" increments. 150 lb. shelf capacity. Combination Cabinet features one full width top shelf and 4 half shelves plus garment hanger bar for full length clothing storage. Durable powder coat finish. Durable All Welded Steel Storage Cabinets Feature Quiet Door Closure To Make These Combination Cabinets The Used Choice For The Office, Warehouse And More. 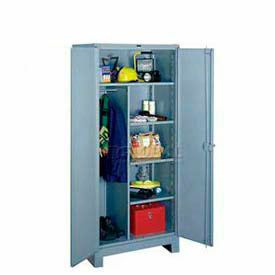 This selection of all welded combination cabinets are available in Commercial and Industrial grade quality construction. These storage and wardrobe closets include sturdy hinges and welded door channel reinforcement that helps maintain alignment and rigidity for long lasting use. 3 point locking mechanism provides improved security. 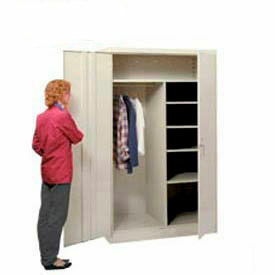 Combination storage cabinets include a full width top shelf, 3 adjustable half shelves and a garment rod. Storage cabinets meet ANSI/BIFMA shelf capacity standards. Raised fixed bottom shelf protects doors from damage. Powder coat finish is available in Black, Light Gray, Putty or Sand. Shipped assembled. 5 Year Limited Warranty. 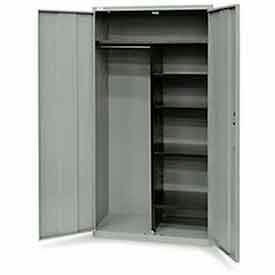 Commercial Storage Cabinets are made with 24 gauge steel and include a single chrome locking handle. 24 gauge steel shelves have a 180 lb. shelf capacity and adjust at 2" increments. 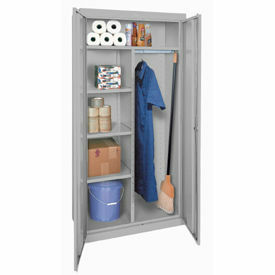 Industrial Storage Cabinets are made with heavier 22 gauge steel and double chrome handles, one locking. 22 gauge steel shelves each support 200 lbs of evenly distributed loads and adjust easily at 2" increments. 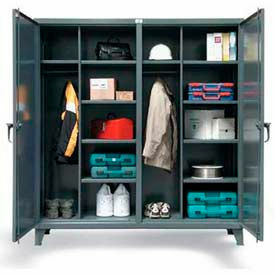 All-Welded Combination Cabinets Provide Added Storage And Security In Residential And Commercial Environments. 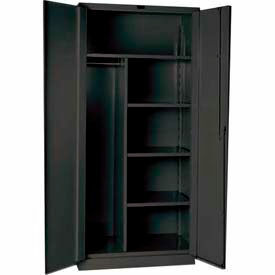 Combination Cabinets are made of 22 gauge all-welded steel for long lasting durability. Cabinets feature a full width fixed shelf, half-width coat rod and 3 height adjustable half-width shelves. Double doors lock with 3 point latching system providing added security and recessed handles prevent banging and catching on flush surfaces. Available colors areCharcoal and Black. Variety of dimensions are also available. Lyon Combination Storage Cabinets Are The Used Choice For Office And Warehouse Environments While Utilizing Contemporary Styling With Durable Construction. Rounded front corners provide an attractive, modern appearance. Storage and wardrobe cabinets feature one full width top shelf and 4 half shelves plus a coat rod for full length clothing storage. Precision engineering, felt pad dampeners and nylon hinge washers give a smooth, quiet door operation to these combo storage cabinets. Doors open full 180° for easy access and include a 3-point locking handle. Doors are channel reinforced for added rigidity. Shelves adjust at 2" increments. Lifetime Limited Warranty. 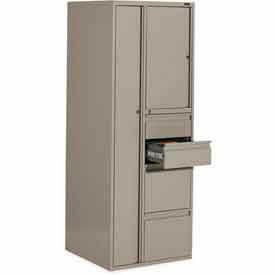 Lyon Heavy Duty Combination Storage Cabinets Provide Excellent Security And An Extended Service Life To Contents. Lyon Heavy Duty Combination Storage Cabinets are made of 14 gauge steel and a baked enamel finish for long lasting durability. Provides garment bar for hanging wardrobe and clothing items and 4 adjustable shelves that bolt securely into keyhole slots on interior channels reinforcements. Shelves provide flanged edges for added rigidity, adjust at 3" increments and have a 1,450 lb. capacity. Two solid doors feature 3 heavy duty welded hinges with 5/16" diameter brass hinge pins to keep contents secure by closing with a 3 point locking mechanism and 3/8" thick round latching rods. Diecast steel door handle provides 3/8" thick padlockable hasp. 7 gauge steel legs are 4"H to allow forkliftable access. Shipped assembled and ready to use. Available widths are 36", 48" and 60". Depth is 24". Height is 82". Colors are Black, Gray and Putty. Lifetime Limited Warranty. Additional Shelves are available. 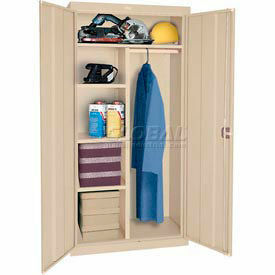 Solid Door Combination Cabinets Provide Maximum Storage Versatility. Solid Door Combination Cabinets are made of 20 and 22 gauge steel, all welded construction for long lasting durability and dependability. Industrial models designed to meet government requirements. Combines ample storage space for supplies and personal belongings with neat, attractive appearance. 3-point positive locking and chrome plated locking handle with built-in grooved key lock provides security. Shelves adjust on 2 inch centers with triple flanged front for added strength (up to 200 lbs. - uniformly distributed). All-welded frame assembly and factory hung reinforced doors ensure proper operation and fit. Greenguard Children and Schools Certified. Series types are Commercial and Industrial. Color finishes are Gray, Midnight Ebony, Parchment and Platinum. Capacities are 1,000 lbs. and 1,250 lbs.. Dimensions vary per type. 2 Year Limited Warranty. Tennsco Combination Cabinets provide Storage for Work Materials, Uniforms, and Equipment for Office Or Warehouse Environments. Tennsco Combination Cabinets are made of cold rolled steel using 24 gauge steel body reinforced with a 22 gauge steel frame and powder coat finish for long lasting durability. Reinforced doors include 3-point locking system with die cast chrome plate locking handles for added security of contents. Locking flat bar rods include nylon guides for smooth door operation. 22 gauge steel shelves are height adjustable at 2" increments. 150 lb. shelf capacity One full width top shelf and 4 half shelves plus garment hanger bar for full length clothing storage. Available Unassembled or All-welded. Colors include Champagne/Putty, Grey, Light Grey, Black, Medium Grey, Sand, Tan, and Putty. Dimensions vary per model. Hallowell 16 Gauge Heavy Duty Classic DuraTough Combination Cabinets Are Built To Last With All-Welded Construction. Hallowell 16 Gauge Heavy Duty Classic DuraTough Combination Cabinets are made from prime-grade cold-rolled sheet steel for long-lasting durability. Features three adjustable shelves and one fixed shelf with 1050-pound capacity. 36", 48" and 60" Widths available. Charcoal finish. One Year Limited Warranty. 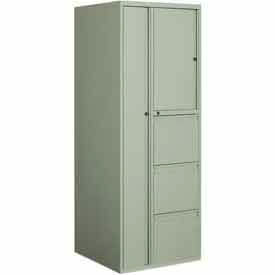 Equipto Combination Wardrobe Cabinets Are Used For Storing Labcoats Or Uniforms Alongside Tools And Materials. 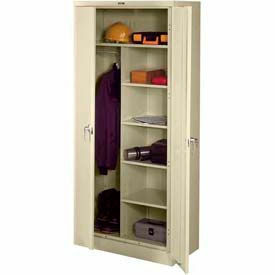 Equipto Combination Wardrobe Cabinets feature a rugged steel construction and 5 shelves plus wardrobe area with rod and 4 hooks. Divider panel permits locating wardrobe on either side. Available in Smooth or Textured Finishes. Smooth Color options include Office Gray and Reflective White Textured Color Options include Black, Cherry Red, Evergreen, Putty, Dove Gray, Regal Blue and Safety Yellow Limited Lifetime Warranty. Hallowell 16 Gauge Heavy Duty Galvanite DuraTough Combination Cabinets Are Used For Moist And High-Humidity Areas. Hallowell 16 Gauge Heavy Duty Galvanite DuraTough Combination Cabinets are made from galvannealed sheet steel and coated with zinc-iron alloy to prevent corrosion in moist and high-humidity environments. Features three adjustable shelves and one fixed shelf with 1050-pound capacity. 36", 48" and 60" Widths available. Charcoal finish. One Year Limited Warranty. Hallowell 14 Gauge Extra Heavy Duty Classic DuraTough Combination Cabinets Are Built To Last With All-Welded Construction. Hallowell 14 Gauge Extra Heavy Duty Classic DuraTough Combination Cabinets are made from prime-grade cold-rolled sheet steel for maximum durability. Features three adjustable shelves and one fixed shelf with 1450-pound capacity. 36", 48" and 60" Widths available. Charcoal finish. One Year Limited Warranty. 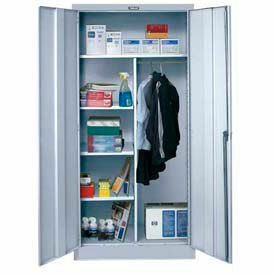 Hallowell 14 Gauge Extra Heavy Duty Galvanite DuraTough Combination Cabinets Are Used For Moist And High-Humidity Areas. Hallowell 14 Gauge Extra Heavy Duty Galvanite DuraTough Combination Cabinets are made from galvannealed sheet steel and coated with zinc-iron alloy to prevent corrosion. Features three adjustable shelves and one fixed shelf with 1450-pound capacity. 36", 48" and 60" Widths available. Charcoal finish. One Year Limited Warranty. Global Industries 9300P Series Personal Storage Tower With 60 Pound Shelf Capacity Provides Flexibility And Customization For Shelving And Cabinet Storage Options. Global Industries 9300P Series Personal Storage Tower With 60 Pound Shelf Capacity is made of steel for long lasting durability. Combination full height wardrobe section, locker compartment, and shelf units are used for hanging garments, personal items, office supplies, files and more. Three separate compartments feature key locks for additional privacy and security. Features leveling glides and ball bearing drawer suspensions. Left or Right hinged doors open away from work surface for easier access. Dimensions are 24"W x 24"D x 65-1/4"H. Available drawer quantities are 3 File or 2 File and 2 Box combination. Colors include Black, Ivory, Grey, Desert Putty, Hunter, Jade, Navy and Russet. Global Industries 9100P Series Personal Storage Tower With 100 Pound Shelf Capacity Provides Flexibility And Customization For Shelving And Cabinet Storage Options. Global Industries 9100P Series Personal Storage Tower With 100 Pound Shelf Capacity is made of steel for long lasting durability. Combination full height wardrobe section, locker compartment, and shelf units are used for hanging garments, personal items, office supplies, files and more. Three separate compartments feature key locks for additional privacy and security. Features leveling glides and ball bearing drawer suspensions. Left or Right hinged doors open away from work surface for easier access. Dimensions are 24"W x 24"D x 65-1/4"H. Available drawer quantities are 3 File or 2 File and 2 Box combination. Colors include Black, Ivory, Grey, Desert Putty, Hunter, Jade, Navy and Russet. 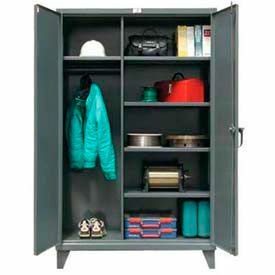 Stronghold® Heavy Duty Combination Cabinets Are Idea For Schools, Laboratories, Locker Rooms And Workshops. The Stronghold® Independent Locking Double Door Wardrobe Cabinet Is Used For Storing Clothes Or Other Supplies For Residential And Commercial Use. This Stronghold® Independent Locking Double Door Wardrobe Cabinet utilizes a sturdy construction and utilitarian design for long lasting durability. This wardrobe locks for increased security and privacy. It features a double shift design, meaning that there are two separate sections with the same features on each side. Each section has two sides. The left side of each section consists of a single top shelf and a narrow compartment with a hanger rod for coats and other clothing. The right side of each section consists of four adjustable shelves to create five separate compartments that can fit a wide variety of common items. 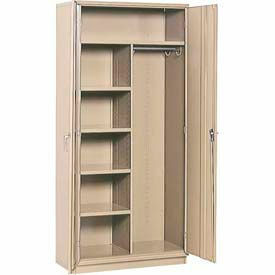 The Stronghold® Independent Locking Double Door Wardrobe Cabinet is made of steel and features an all-welded assembly. It has a shelf capacity of 1025/825 lbs and is only available in a dark gray powder coat finish. ALB Plus Combination Cabinets Hold Both Workplace Supplies And Employee Belongings In One Convenient Location. ALB Plus Combination Cabinets are manufactured from steel for lasting durability and structural integrity. Storage cabinet includes one full-width shelf and four half shelves to accommodate both large and small items. 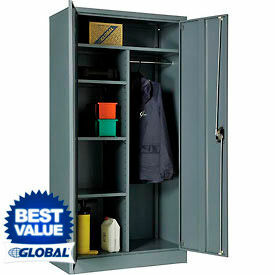 Full-length compartment with crossbar is great for storing coats, coveralls, work shirts and other clothing. Flush recessed handle provides secure grip and cylinder lock secures valuable personal belongings. 36"Wx18"Dx72"H combination cabinet is available in Beige, Black, Charcoal and Light Grey colour finish.